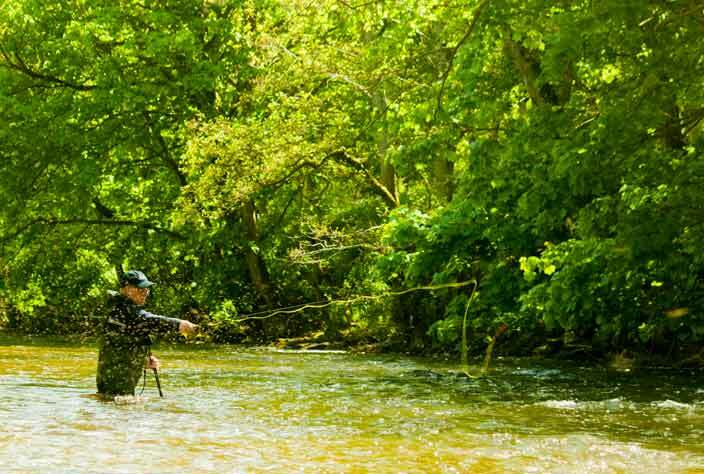 We provide fly fishing lessons on our tranquil private beat of the River Derwent near the village of Darley Dale in Derbyshire. This beautiful Peak District river starts it’s life on moorland high above the Derwent Dams before making it’s way down through Chatsworth and eventually joining the river Trent. 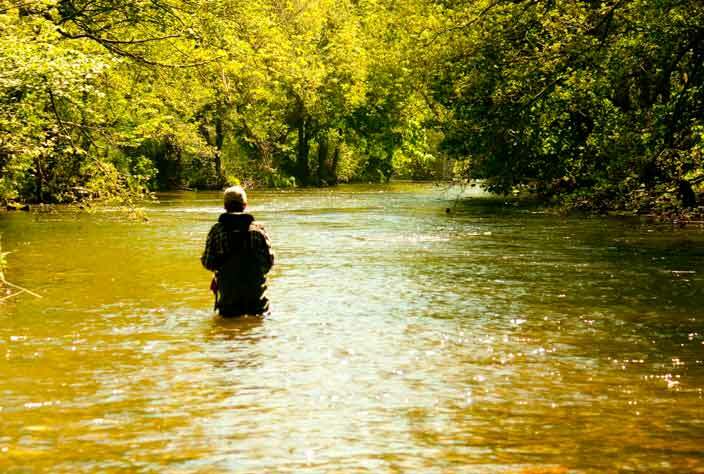 Fly fishing lessons on the river are available to complete novices right up to experienced fly anglers. 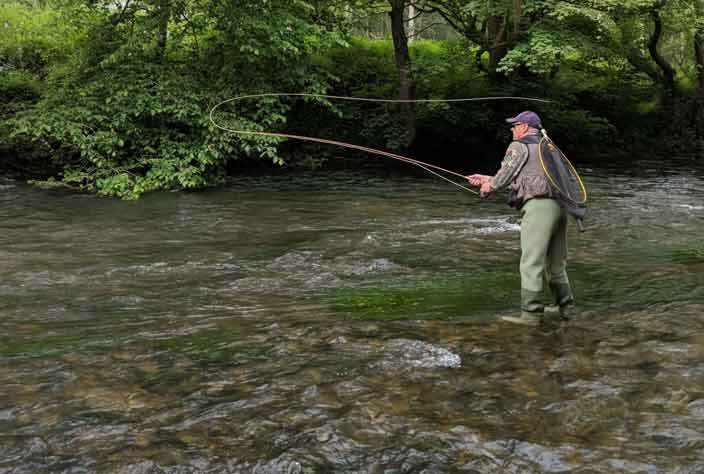 Your river lesson will be provided by David Johnson a UK champion fly angler, author and professional fly fishing coach. 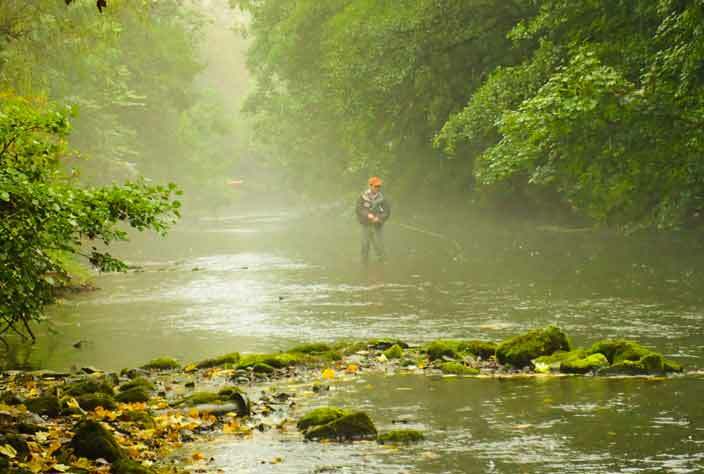 Fly fishing lessons in the Peak District can be booked for a specific date or if you fancy buying a fly fishing lesson for a loved one, why not treat them to a fly fishing gift voucher which can be redeemed for a lesson on this stunning section of river. The cost of your fishing permit and all the tackle (including waders) are included and provided. Wildlife is abundant on this particular beat of river, Kingfishers make a near daily appearance with their iridescent blue hue streaking up the river for our anglers delight. Dippers are also a common site bobbing up on the rocks and diving in the shallows. Wagtails, Moorhens & Water Voles are also present, we often find our clients will sit and enjoy the tranquility and wildlife as much as the fishing! The river is on Private Land with no public access, there are also no roads near to the bank meaning that our guests enjoy a relaxing lesson away from the hustle & bustle of their daily lives! 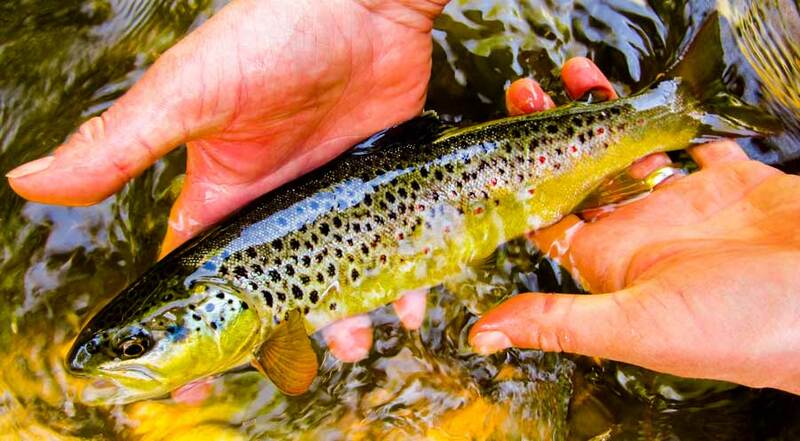 The beat contains an excellent head of mainly Wild Brown Trout as well as Grayling. We also catch Rainbows from time to time that have been stocked elsewhere in the river. We are also extremely lucky to be able to catch wild Rainbow Trout in the river which spawn just upstream in the River Wye. Fly life is excellent on the river with good hatches of Grannom Caddis, Large Dark Olives & Mayfly as well as the usual upwing and caddis species. 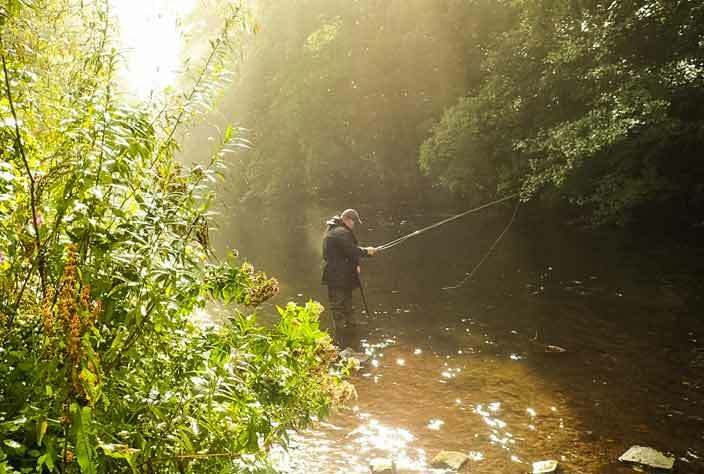 Your fly fishing lesson on our Peak District river will be tailored to suit your needs and ability however we like to give our guests a general idea of what happens on a typical day. 9am – Meet and chat about your needs and ability. 9.15 – Tackle. Set up and discussion. We will cover how to set up correctly and talk about line & rod weights, leaders and flies. 9.30 – Casting. For novices we will work through the basic overhead cast, side cast and shooting line. For more advanced anglers we will tune up your existing cast, provide fault diagnosis and work on advanced casting techniques. 10. 30 – River watercraft. We will discuss the life of the river, where fish like to hold and their habits. Will will look at how the weather affects the fishing as well as water levels and the natural cycle of fly life during the year. 11.00 – Wet fly fishing. We cover the basics of wet fly fishing and will look at various techniques such as across and down and traditional upstream spider fishing. For more advanced anglers we will look for example at the benefits of the reach cast for a downstream drift when fishing across. 12.00 – 30 minute lunch break. 12.30 – Upstream dry & nymph fishing. 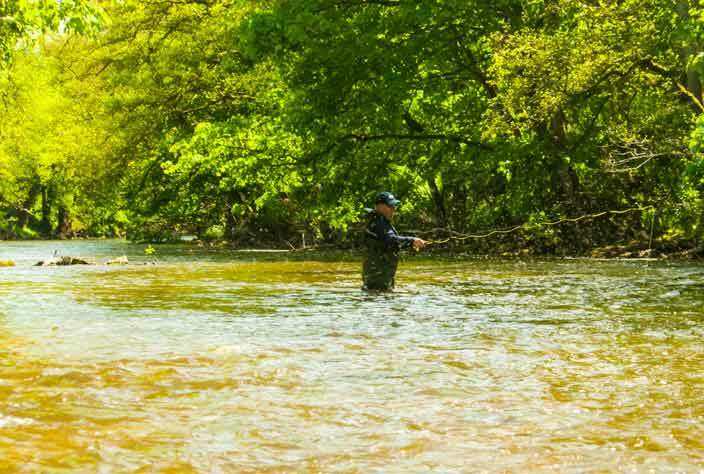 Here we look at these two popular methods of fly fishing and how to cast, manage the line and see the take. 2.30 – Czech nymphing. You will be taught how to fish using the Czech nymph which can be deadly when the fish are close to the bottom. This method is normally responsible for some of the monsters we catch during fly fishing lessons! 3.30 – Recap. We will recap the days learning, answer questions and help you with any other fly fishing techniques you would like to cover. We would be delighted to welcome you to the river for your Peak District fly fishing lesson whatever you ability. River lessons are suitable for over 18’s (We run still water lessons for junior anglers) If you have any questions or would like to make a booking or buy a gift voucher for a fly fishing lesson, please get in touch on 01143 600 590 or email us.